Look up plug-in or add-on in Wiktionary, the free dictionary. 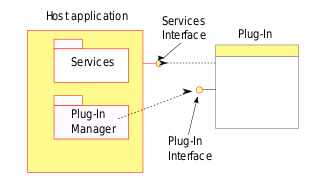 In computing, a plug-in (or plugin, add-in, addin, add-on, or addon) is a software component that adds a specific feature to an existing computer program. When a program supports plug-ins, it enables customization. Web browsers have historically allowed executables as plug-ins, though they are now mostly deprecated. (These are a different type of software module than browser extensions.) Two plug-in examples are the Adobe Flash Player for playing videos and a Java virtual machine for running applets. A theme or skin is a preset package containing additional or changed graphical appearance details, achieved by the use of a graphical user interface (GUI) that can be applied to specific software and websites to suit the purpose, topic, or tastes of different users to customize the look and feel of a piece of computer software or an operating system front-end GUI (and window managers). to separate source code from an application because of incompatible software licenses. Audio editors use plug-ins to generate, process or analyze sound. Ardour and Audacity are examples of such editors. Digital audio workstations (DAWs) use plug-ins to generate sound or process it. Examples include Logic Pro X and ProTools. Email clients use plug-ins to decrypt and encrypt email. Pretty Good Privacy is an example of such plug-ins. Video game console emulators often use plug-ins to modularize the separate subsystems of the devices they seek to emulate. For example, the PCSX2 emulator makes use of video, audio, optical, etc. plug-ins for those respective components of the PlayStation 2. Media players use plug-ins to support file formats and apply filters. foobar2000, GStreamer, Quintessential, VST, Winamp, XMMS are examples of such media players. Packet sniffers use plug-ins to decode packet formats. OmniPeek is an example of such packet sniffers. Remote sensing applications use plug-ins to process data from different sensor types; e.g., Opticks. Text editors and Integrated development environments use plug-ins to support programming languages or enhance development process e.g., Visual Studio, RAD Studio, Eclipse, IntelliJ IDEA, jEdit and MonoDevelop support plug-ins. Visual Studio itself can be plugged into other applications via Visual Studio Tools for Office and Visual Studio Tools for Applications. The host application provides services which the plug-in can use, including a way for plug-ins to register themselves with the host application and a protocol for the exchange of data with plug-ins. Plug-ins depend on the services provided by the host application and do not usually work by themselves. Conversely, the host application operates independently of the plug-ins, making it possible for end-users to add and update plug-ins dynamically without needing to make changes to the host application. In Mozilla Foundation definitions, the words "add-on", "extension" and "plug-in" are not synonyms. "Add-on" can refer to anything that extends the functions of a Mozilla application. Extensions comprise a subtype, albeit the most common and the most powerful one. Mozilla applications come with integrated add-on managers that, similar to package managers, install, update and manage extensions. The term, "Plug-in", however, strictly refers to NPAPI-based web content renderers. Plug-ins are being deprecated. Plug-ins appeared as early as the mid 1970s, when the EDT text editor running on the Unisys VS/9 operating system using the UNIVAC Series 90 mainframe computers provided the ability to run a program from the editor and to allow such a program to access the editor buffer, thus allowing an external program to access an edit session in memory. The plug-in program could make calls to the editor to have it perform text-editing services upon the buffer that the editor shared with the plug-in. The Waterloo Fortran compiler used this feature to allow interactive compilation of Fortran programs edited by EDT. Very early PC software applications to incorporate plug-in functionality included HyperCard and QuarkXPress on the Macintosh, both released in 1987. In 1988, Silicon Beach Software included plug-in functionality in Digital Darkroom and SuperPaint, and Ed Bomke coined the term plug-in. ^ "PCSX2 - The Playstation 2 emulator - Plugins". pcsx2.net. Retrieved 2018-06-10. ^ Bernert, Pete. "Pete's PSX GPU plugins". www.pbernert.com. Retrieved 2018-06-10. ^ Team, Demul. "DEMUL - Sega Dreamcast Emulator for Windows". demul.emulation64.com. Retrieved 2018-06-10. ^ "Android Emulator Plugin - Jenkins - Jenkins Wiki". wiki.jenkins.io. Retrieved 2018-06-10. ^ "KDE/dolphin-plugins". GitHub. Retrieved 2018-06-10. ^ "Cemu Plugin Loader Makes It Easy To Load In DLL Plugins". One Angry Gamer. 2017-07-14. Retrieved 2018-06-10. ^ "OpenEmu/SNES9x-Core". GitHub. Retrieved 2018-06-10. ^ "Recommended N64 Plugins". Emulation General Wiki. Retrieved 2018-06-10. ^ "Playstation plugins & utilities!". www.emulator-zone.com. Retrieved 2018-06-10. ^ "PS3 Homebrew Apps / Plugins / Emulators | PSX-Place". www.psx-place.com. Retrieved 2018-06-10. ^ Mozilla Firefox plugins – Description of the difference between Mozilla Firefox plugins and extensions under the general term add-on. ^ Wordpress Plug-in API – Description of the Wordpress Plug-in architecture. ^ Paul, Ian. "Firefox will stop supporting plugins by end of 2016, following Chrome's lead". PCWorld. IDG. Retrieved 20 October 2016.